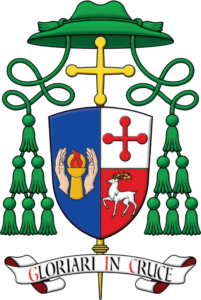 Bishop McCarthy has chosen as his motto “Gloriari in Cruce” (Boast in the Cross) from St Paul’s Epistle to the Galatians 6:14. The shield is divided horizontally – silver half above is with a red cross of St Michael the Archangel and red half below is charged with the stag of the McCarthy clan in silver with horns and hooves gold. These canting arms which represent the bearer’s name is a visual pun and say, in heraldic terms, Michael McCarthy. The blue background and the chalice represent the Virgin Mary, the living chalice from whom came Jesus Christ, who, in turn, is represented by a red flame surrounded by a golden halo. The whole is protected by the enfolding hands of St Joseph, guardian of the Holy Family and patron of the Diocese of Rockhampton. The Bishop’s arms were designed by Richard d’Apice AM and Sandy Turnbull of The Australian Heraldry Society and Fr Guy Selvester, and were emblazoned by Sandy Turnbull.